ust in case you have $4,999 lying around and have a hankering to print in carbon fiber, the Mark One 3D printer is now available for pre-order. When first announced last month, the Mark One was going to be available to order in March, but today is your lucky day. Named aptly for its creator, Gregory Mark, who also owns Aeromotions, this desktop printer debuted at SolidWorks World 2014 in San Diego. After seeing the expense and time currently associated with carbon fiber manufacturing, Mark started down a path that eventually ended up at the Mark One. 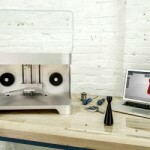 The printer can not only lay down carbon fiber, but also fiberglass, nylon and PLA. Of course, only one at a time. The printer employees some pretty nifty advancements, too, including a self-leveling printing bed that clicks into position before each print. For a few dollars more, the company also offers a Mark One Developer Kit Pre-order that puts your order at the front of the line and includes a few extras, including more Kevlar and two extra beds. Posted in Mark One. Bookmark the permalink.